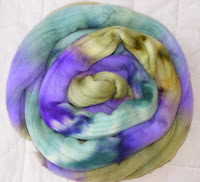 This is some yarn I dyed over the weekend to exchange with someone on Ravelry. There's 1.8kg of chunky weight Falkland yarn (spun in Yorkshire, mind!) which I'm swapping for a rather nice set of interchangeable bamboo circs. I was given a couple of links to colours to aim for, and I think I did pretty well - this was taken last night with flash so it's not quite right. It went off this morning and was vastly expensive, but it's not worth sending surface, it takes so long. However ,I heard back from another Ravelry swap this afternoon - I'd send about 600g of my superfine merino out in a swap for a hat kit, and the fibre's arrived - spilling out of it's bag, tangled up, and about a third missing. I've also heard from another source of fibre going missing in the US postal system - perhaps someone can't quite believe that fibre such as this actually has value, and we must be smuggling something inside it. Either that or they needed some packing so ripped open a suitable package going through. I said I'd send more fibre, which I'm more than happy to do, but I do hope the yarn gets through OK. The weekend's dyeing. All in the superfine merino, and nearly two and a half kilos in all. I was particularly pleased to do it all in the same lot of water, dyeing to exhaustion, spinning it out and recycling for each dye lot, so I didn't have to keep heating it up, and of course it's quicker too. Once the vinegar/citric acid is in the dyewater it continues to work through all subsequent lots. Note the different wings. These are my third pair! I'm much happier with these (very strange, spending the last day or so working out my wings....) so have written up the pattern, argued with my computer as I had to download both .pdf readers and writers (they're on the one at work, not this one), and set it up as a Ravelry download. I wonder how many other people will feel to need to make themselve a hat with wings. I changed the name. It's now the Winged Cap, as I thought the Brunhilde Cap was silly. 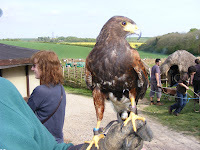 I looked much more Valkyrie-like than anything else when I was taking photographs. Sadly my arms aren't long enough to take a decent photo of myself head-on, but those that I had were Wagnerian! People may well agree that at this point I have completely lost it. 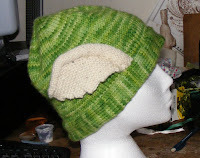 But I decided that a woolly hat with wings was something I just couldn't do without. I have to double-check the wing pattern (as it's not a case of making two, the wing rib has to be reversed) but they'll be a pattern on Ravelry later today. Aren't the colours pretty? This is the Wonderwool leftovers in the 4ply Whitefaced Woodland yarn, just before I embark on dyeing more. A friend has just used some to make a lovely Baby Surprise jacket, and asked me what other colours I have. They're so pretty on the photos I had to post here too. 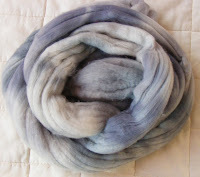 A quick and not very good photograph of the Romney yarn I finished spinning and dyeing on Saturday. Two skeins each of the dark, pale and paler grey, one of each stuffed in a green dyebath. It looks much bulkier than it really it - that's both my spinning and the preparation - but will knit up on 3.5 or 4mm needles. 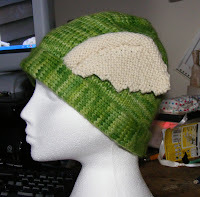 Although if I do use it for doubleknit, I may need to take the needles down a size. But as I'm suddenly inspired to whizz down the last sleeve for the third and final Ramshorn cardigan, I must not start it until I am at least on the Ramshorn front borders. I've been busy this week, but so tired - still need to catch up on sleep since the weekend. This isn't helped, of course, by staying up til after midnight spinning on Wednesday night and drumcarding on Thursday. I've been a bag of a lovely Romney fleece in lots of greys that Sarah gave me last Woolfest. It's been washed and waiting attention for ages. So I have two skeins of pale grey, two of medium, and eight batts of dark grey that I did last night, listening to a Dragonfly Moon CD and watching pots of Rose on coloured BFL simmering on the hob. The yarn is a 2-ply, about a dk thickness but quite airy and puffy (I find it difficult not to spin airy and puffy from freshly carded batts) and I have plans for a double-knit vest once I've dyed half green, but this may change. I meant to photograph the yarn production from scratch, but naturally remembered this just as I was flicking the last of the original fleece. The original inspiration was a vest I saw a woman wandering around in at Woolfest - natural coloured brown yarn with a colourwork pattern on in a bright orangey-red. This really appealed - the colour combination - but I'm not so sure I'd actually wear something patterned in red, especially as I plan this in double knit (my first project in this technique, so of course I'm not going to do something small and simple). So green is likely to be the alternative. So not surprising. 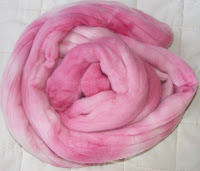 Someone from Brighton ordered 200g of the BFL in Rose at Wonderwool, so I thought I'd better get on with it for them. 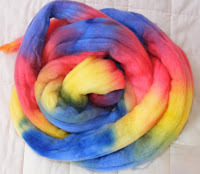 I dyed 1200g, so there's some to list on Etsy next week when it's photographed. Really, I couldn't be bothered to get more dyes out than the four needed for that colourway, so that's what kept going on. All of this would be so easy to document (with photos) if the computer at home was talking to the interweb. Naturally, after a tremendous start on Tuesday evening when Andrew came round, plugged it in and produced amazingly fast speeds, it was not. The network is there, my computer can tell it's there, but it's not talking to it. Ppffllbbtt! I had a fantastic but exhausting weekend with my friend Penny down in Southsea. Saturday and Sunday at Butser Iron Age Park, burning wicker men, lots of hard work, heavy horses, dogs in the sea and Roman palaces. All on the other blog. And a working computer at home, with a surprisingly speedy connection. No excuses not to keep Etsy and Ravelry completely up to date. 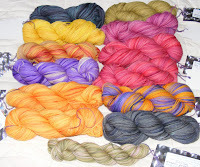 I think I might have to get lots of handspun without a home up on my trading pages.